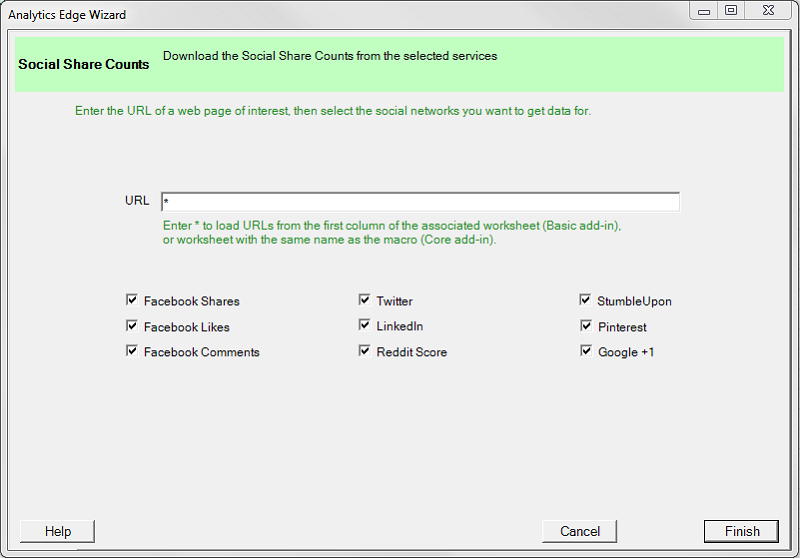 This FREE connector from Analytics Edge can be used to get the social share counts for any URLs you enter in your worksheet. Just fill up the first column and click Refresh. Simply Free, available is both Analytics Edge Add-ins. Note: Facebook and Twitter counts are no longer publicly available, and are no longer available from the connector. 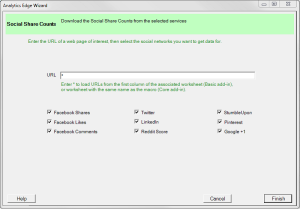 The Social Shares connector is provided free, as-is, without warranty, and can be used with the also-free Analytics Edge Basic Add-in (v1.6 or higher) to provide a simple tool to keep track of your social success, or that of your competitors! Combine it with the Analytics Core Add-in and other Analytics Edge connectors as part of an inexpensive reporting solution that doesn’t require formulas or programming. Don’t suffer through PHP or Python coding options when you can get your data right into Excel in seconds at the click of your mouse!